The Philippines has more than 7,100 islands, which means that there is coastline everywhere. The country has more beaches than you can possibly imagine, but of course, some are more beautiful than others. Both local and foreign tourists, however, tend to like the beaches that have pure white sand. And it does tend to go better against the backdrop of the blue sky, the blue water, and the swaying palm trees. #1 - White Beach, Boracay: Going to Boracay Island in Aklan, can be your perfect getaway with your friends or family – it’s where you’ll get the total package for rest and recreation. Be it the awesome hotels, restaurants, water activities, sparkling blue-green water, powdery white sand, spas, shops, bars, etc. ; name it, they have it. Absolutely one for the bucket list! #2 - Banal Beach, Coron: The excitement never stops in Coron, Palawan, where you’ll find excellent white sand beaches, such as Malcapuya Island, Banana Island and Banol Beach. On top of that, you’ll also get the chance to have fun in their terrific dive sites, named as one of the top 10 in the world by Forbes Traveler Magazine because of the several sunken Japanese shipwrecks from WWII, to see there underwater…all these and many, many more in store for you to explore! #3 - Miniloc Island, El Nido: When God showered stunning natural resources in the Philippines, perhaps El Nido, in Palawan, caught most of them. Unbelievable? But true! It is even often called The Philippines’ Last Frontier; we can’t argue with that especially due to the island’s gorgeous marble cliffs, 100 white sandy beaches, ancient caves, breathtaking lagoons, over 30 dive sites so rich with marine life, scenic waterfalls…and of course, not to forget, their heavenly cuisine—complete with mouthwatering seafood, French, German, Swiss or Australian dishes! Dig in! 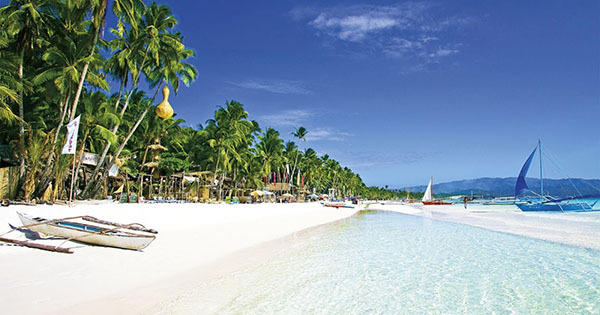 #4 - Alona Beach, Panglao Island: Famous for Alona Beach – which has white sand and crystal clear water, Panglao Island is also known as one of the main tourist attractions in the Philippines. Divers and snorkelers alike especially love Balicasag Island, which is a small almost round, flat island, which is about 25 hectares – around which lots of fish, jacks, barracudas and mackerels can be found. Hence, diving there is one of the best in the country. Truly a must-see! #5 - Calaguas Island, Vinzons: Pack up for a real adventure of backpacking for some camping and relaxing on no less than our 5th placer…Calaguas Island! Located in Camarines Norte, in the Bicol region of Luzon, Calaguas has recently been flocked to by so many tourists, mostly young professionals; despite its not having any resorts yet. They are visiting to enjoy its soft white sand, the island’s serenity as well as the cool, crystal clear water…What an amazing discovery! The next Boracay, could this very well be?